This naptime picture book follows the tired little baby’s trip around her own yard, where she meets friendly animals and discovers that being “squirrely” and “owly” like them only make her more sleepy. Finally, she curls up to sleep in her own silky blanket like her friend the caterpillar. 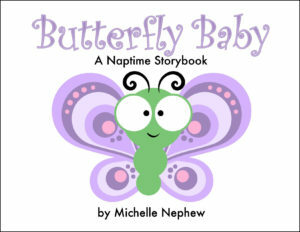 Adorable illustrations make Butterfly Baby an instant bedtime favorite!